Here's a flight that will add a lot to your ADF abilities—and to your confidence. You'll depart White Plains/Westchester County Airport to the south, for Republic Field. The airport will be under IFR conditions. You'll be cleared for an NDB approach, which will require you to fly over the airport, to proceed out over the Atlantic shore, and then to execute a procedure turn in order to come back in and land on Runway 1, using the ADF at every stage. You'll depart White Plains/Westchester County Airport on Runway 16, and then will intercept Carmel R-190, which you'll track outbound. 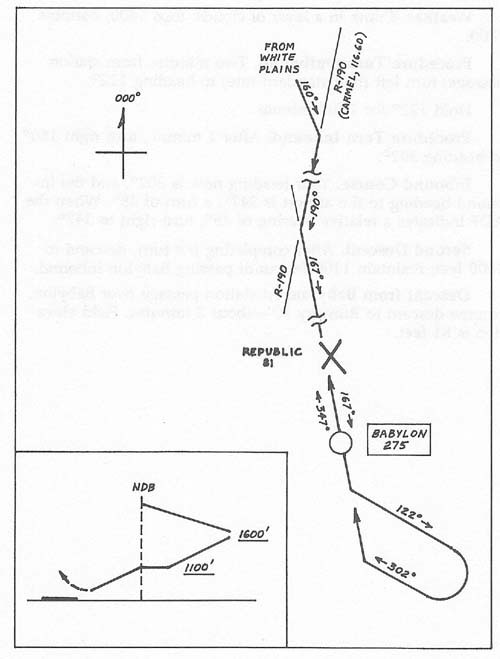 As you approach Republic Field, you'll turn left to 167°, toward the Babylon NDB, as shown by Figure 4–9. That course will take you over the airport and over the NDB; then you'll execute the procedure turn specified in the approach plate, which is provided in Chapter 5. Then, after turning back toward the airport, you'll begin your descent to Runway 1. Departure. Use Runway 16; climb out on 160 and level off at 2500 feet. Carmel R-190. As NAV-1 centers, turn right to 190° to track outbound. Turning Inbound. Your present heading is 190°, and the inbound course is 167°, a left turn of 23°. Therefore, start the turn when the ADF needle is deflected to the left for a relative bearing of 23°. After the turn, if the ADF bearing is more than 5° from 000°, use a 20° correction angle, as shown in Figure 4-7. Changing NAV-1. Now switch NAV-1 to Deer Park (111.20) R-220, to help you determine when you're approaching the NDB. Initial Descent. Without setting up yet, throttle back and establish a 500fpm descent (at 120 knots) to 1600 feet. Station Passage and Set-Up. NAV-1 will warn you as you approach Babylon NDB. Hold your heading of 167° as the ADF needle drifts away from center. Note the time of station passage and write it down. Then slow down and set up for the approach. Maintain heading 167° for 2 minutes beyond station passage. Weather. Crank in a layer of clouds: tops 1400, bottoms 1100. Procedure Turn Outbound. Two minutes from station passage, turn left (half standard rate) to heading 122°. Hold 122° for 1 full minute. Procedure Turn Inbound. After 1 minute, turn right 180° to heading 302°. Inbound Course. Your heading now is 302°, and the inbound heading to the airport is 347°, a turn of 45°. When the ADF indicates a relative bearing of 45°, turn right to 347°. Second Descent. After completing the turn, descend to 1100 feet; maintain 1100 feet until passing Babylon inbound. Descent from Babylon. At station passage over Babylon, resume descent to Runway 10—about 2 minutes. Field elevation is 81 feet.